The defending state champion and top-ranked Hanover Wildcats will put their 22-game winning streak on the line when they travel to face the Caldwell Blue Jays in the second round of the 8-Man D-II playoffs. Hanover hasn’t lost since falling to Spearville in the 8-Man D-I state championship game in 2015. During the regular season, the Wildcats posted five shutouts and outscored their opponents by a combined score of 492-32. Last week’s 64-32 playoff win over Mankato-Rock Hills was the first time this season that Hanover allowed more than 12 points in a game. Junior quarterback Daiken Stallbaumer has led the Hanover offense, passing for 564 yards and nine touchdowns. He’s also rushed for 475 yards and 14 touchdowns. Senior Kevin Diederich has rushed for 680 yards and 17 touchdowns on only 44 carries, which equates to an amazing 15.5 yards per carry. As a team, the Wildcats average 10.5 yards per rush. Thomas Atkins is the top receiver with 10 catches for 224 yards and three touchdowns. Junior Pete Peters paces the defense with 46 tackles and four sacks. Caldwell’s only loss this season came 74-28 to Hutchinson Central Christian in the final week of the regular season. The Blue Jays bounced back, however, with a 42-34 win over Waverly in the first round of the playoffs. Last year, Caldwell failed to make the playoffs with a 7-2 record. Blue Jays junior quarterback Corbin Rice has passed for 962 yards and 19 touchdowns, while rushing for 524 yards and 13 touchdowns. Dakota Volvak leads the rushing attack with 707 yards and eight touchdowns on only 94 carries. Junior Jalen Risley has 31 catches for 700 yards and 12 touchdowns. While Caldwell has displayed a potent offense, Hanover should be too much on both sides of the ball. South Barber, which has not been ranked at any point this season, has quietly posted another strong year. Last season, the Chieftains finished 9-2 and lost to Wallace County in the second round. This year, South Barber is again 9-1. Sophomore Trevor Rooks has stepped in well for departing all-state quarterback Grant Cantrell. He has completed 64 of 108 passes for 944 yards with a 22/3 ratio. He leads the Chieftains with 123 carries for 703 yards and 13 TDs. Senior Trae Rathgeber has 94 touches for 1,008 yards and 21 offensive scores. He also has three special teams touchdowns. Junior Neal Gugelmeyer had a prolific sophomore year but has played in just six games this fall. He has not played since Oct. 13 and had limited action in the two games prior. He has 55 carries for 513 yards and nine TDs. South Barber is again strong in turnover margin with 27 forced and a plus-18 margin. Last year, the Chieftains were plus-11 in turnover margin. South Barber won District 7 and has outscored teams 480-75 with the second-weakest schedule in Division II, according to Prep Power Index. Hodgeman County stands at 8-2 with a total margin of 464-191 against the No. 9 SOS. South Barber’s lone loss came on the road, 34-30, against Argonia-Attica in Week 4. SB has averaged 7.8 yards per play. The Chieftains defeated Rolla, 68-8, in the first round. Rolla technically lost the runner-up spot to Moscow but qualified for the playoffs, because the Wildcats had to forfeit a district game. Hodgeman County, the preseason west favorite in August, has lost only to Spearville (64-34 in Week 2) and Otis-Bison (58-26 in Week 9), two prolific teams that have combined for just one loss. 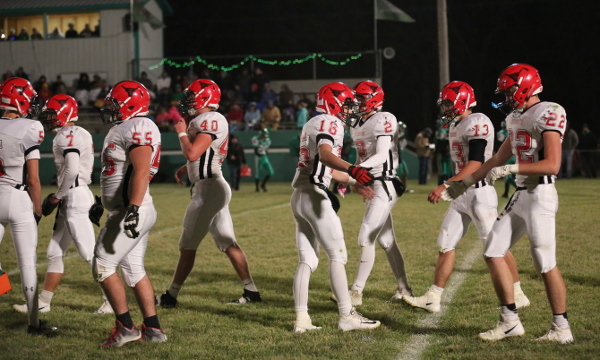 Hodgeman County has encountered multiple injuries and key players banged up but had an impressive 59-14 road win at Northern Valley in the first round. The game was tied at eight after the first quarter before the Longhorns outscored the Huskies, 30-0, in the second. Eli Salmans had a big game with 20 carries for 234 yards and four scores. Jacob Salmans was an efficient 10 of 13 for 108 yards with a TD. Hodgeman County was plus-3 in turnover margin, and Trevor Morgan returned a kickoff for a score. Hodgeman County has averaged 7.6 yards per play with a similar run-pass ratio to the Chieftains. Senior Jacob Salmans has completed 55 of 95 passes for 865 yards and a 7/3 TD/INT ratio. Sophomore Eli Salmans has 161 carries for 1,173 yards and 20 rushing scores. The Longhorns have committed just three turnovers and stands at plus-15 in turnover margin. This marks the first matchup since ’05 when South Barber defeated then-Jetmore (before the consolidation of Hanston/Jetmore), 44-36. Hodgeman County has had some issues in run defense, but has the experience, especially under center.